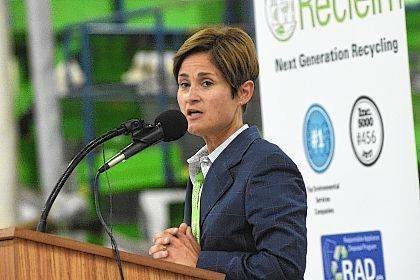 LIMA — The grand opening of the new Recleim appliance demanufacturing plant was held at the Recleim recycling plant at 1601 E. Fourth St. on Tuesday. The Recleim factory is the culmination of more than a year of work and partnerships between Recleim, JobsOhio, Allen County Economic Development Group and American Electric Power-Ohio and other Ohio utility companies, said Dave Stratton, director of business development for the Allen Economic Development Group. The Recleim factory is important because it performs the opposite function of usual factories, said Steve Bush, CEO of Recleim. It’s also the first of it’s kind in Ohio. Instead of taking parts and manufacturing them into a usable product, a refrigerator or freezer, Recleim demanufactures refrigerators and freezers back down into their basic parts, he said. “We remove all of the crisper drawers, shelving and everything that is glass first,” Bush said describing the refrigerator demanufacturing process. “Then we take out the oils and refrigerant out of the cooling circuit. Those are part of what can contain ozone-depleting gas. Then we cut out the compressor and shred the body of the refrigerator that is left. What remains after the process are metals and plastics that are sold for repurposing, he said. From start to finish the demanufacturing process takes five minutes or less to complete, he said. At the time of the grand opening Tuesday, the Recleim plant has one working demanufacturing line built and operational, with plans to build a second, Bush said. After the plant is ready it will create 150 total jobs for the area, he said. AEP-Ohio is offering customers a $50 incentive to recycle their outdated refrigerators and freezers to celebrate Recleim’s grand opening. Cox’s daughter had an old refrigerator picked up by Recleim and transported to the factory for the dedication ceremony Tuesday morning, he said. She had been using it as a second refrigerator until realizing how much it was costing her, Cox said. “The jobs it’s creating in the community are very significant,” Cox said.